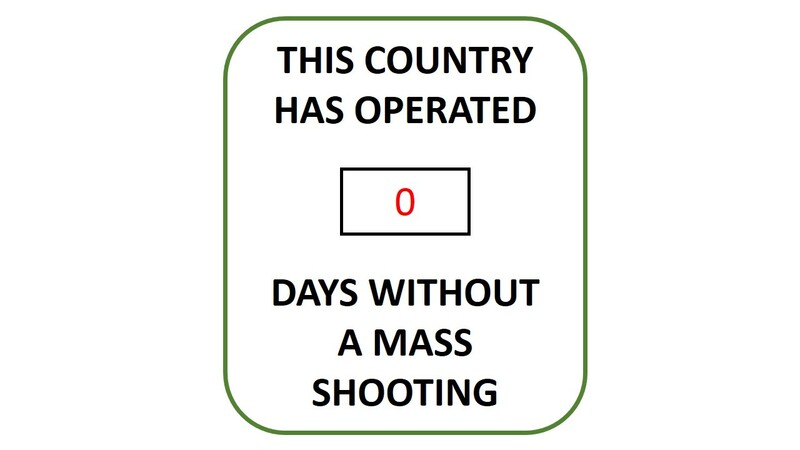 WASHINGTON, DC – Following the tragic shooting in a Washington Navy Yard that killed at least 12 people, the national “Days Without A Mass Shooting” sign clicked back down to zero. The sign was originally erected in 1995 by the NRA to inspire people to be careful and remind them to stop shooting each other. The daily counter made it all the way to 276 days, the amount of time since the Sandy Hook Elementary School shooting on December 14, 2012, which resulted in the heartbreaking deaths of 26 children and teachers. The shooting rampage that resulted in six deaths by the hand of Pedro Alberto Vargas in Hialeah, FL in July of this year did not reset the counter as the definition of “mass shooting” was amended to be no less than 10 people when the U.S. ban on assault weapons was lifted in 2004. Some have called for more drastic measures in an effort to increase the streaks between shootings; in response, the NRA has vowed to make the sign bigger.